TOKYO--(BUSINESS WIRE)--Toshiba Electronic Devices & Storage Corporation (“Toshiba”) announces MG08 Series, the industry’s largest capacity 16TB  Conventional Magnetic Recording (CMR) HDD. With 33% more capacity than today’s widely adopted 12TB drives, and 14% more capacity than prior 14TB models, MG08 16TB drives are compatible with the widest range of applications and operating systems, and adapted to mixed random and sequential read and write workloads in both cloud and traditional datacenter environments. 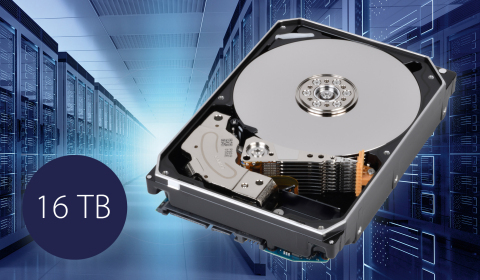 Toshiba's new 16TB hard disk drives, the industry's largest capacity CMR HDD, deliver new level of storage density and improved power efficiency.